The Red Dead Online Beta just got its latest update, and it's bad news for anyone who's been terrorizing the plains. Rockstar is adding NPC bounty hunters to track down naughty cowboys, and making some changes to player visibility to lessen the opportunities for horse-based trolling. They'll appear in the game on February 26. "Criminal behavior will have bounty values and honor consequences that scale based on the severity of the crime," says Sheriff Rockstar. "For example, killing another player can incur a higher bounty, while assaulting townsfolk or animal cruelty could give you a lesser bounty if the crime is reported, while lower-level crimes like looting and ransacking will only decrease your honor." Even if you manage to escape the NPCs' clutches, once your bounty passes a certain threshold you'll be wanted dead, and it'll become harder for you (and anyone riding with you) to avoid the bounty hunters. If your problems in Red Dead Online have more to do with real people than NPCs, Rockstar is also making some changes to how players appear on the mini-map, based on player feedback. Now other players won't see you on the minimap unless you're within 150 meters of them, though you'll appear at further distances if you fire your weapon. "This prevents players from being repeatedly targeted across the map at long distances," says Rockstar. This same system will also highlight aggressive players, making it easy to see who's bad news - and how to avoid them - with a quick glance at your map. "If your style of play becomes more hostile, your map position (and the position of your Posse members) will become more visible to other players with a progressively darkening dot that incrementally shifts from blue to dark red," says Rockstar. "Your visibility increases through bad deeds such as attacking and killing other players or their horses outside of a structured mode, Free Roam Mission, event or competition, and the shorter the time between bad acts, the more your visibility increases. Shift back to a more righteous path and your visibility will fade over time." If only such a thing existed for real life. 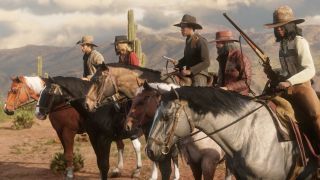 "We’re also introducing Posse-wide Parleys and improving Feuds," Rockstar continues. "You’ll soon be able to initiate Parley that applies to your attacker’s entire Posse after just a single kill. Alternatively, if you’d rather challenge your opponent, you can initiate a Feud, Posse Feud or Leader Feud after one kill, quickly turning a dispute into a timed mini-deathmatch for rival players to fight out amongst themselves in Free Roam, earning points for each kill on the opposing player." Other fixes include weapon balancing, new daily challenges to earn XP and Gold Nuggets, and voice chat, all while Rockstar continues to listen to player feedback to evolve the game. I'll just be over here submitting 3,200 suggestions for pet dogs. Our complete Red Dead Online guide has everything you need to become the ultimate online cowboy.